The past few days have been cool and rainy. Good for the flowers, but not good for the spring soccer season. This a comforting bowl of soup to warm the body. The yellow split peas are packed with fiber, they are good for the heart, and they also help stabilize blood sugar levels-- perfect for those energy burning soccer bodies. Aside from the nutritional benefits, it also helps use up Easter ham leftovers--perfect for moms like me. I make this soup year 'round, not just after Easter, so I am listing the liquid ingredients as chicken broth, for that is what I use a majority of the time. 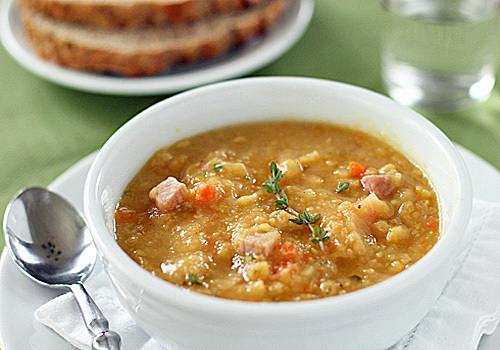 However, you can use water and the leftover ham bone to really add a depth of flavor to this soup. As much as I enjoy this right from the pot, storing any leftovers gives it that "next day goodness". On that note, if you do have leftovers, the soup thickens a great deal and needs to be thinned with more broth before reheating and serving. I like to serve this soup with some brown soda bread and a little butter to wipe up every last bit of goodness from the bottom of the bowl. Before I get to some leftover ham and egg recipes, I just had to share this tart. I made this tart years ago and I knew it was good, but I had forgotten how good. The lightness of the white chocolate mousse paired with the sweet strawberries is a match made in dessert heaven and that is exactly where you will go after one bite of this luscious tart. Other than the white chocolate, there is no added sugar in the mousse, so buy quality white chocolate for the best flavor. 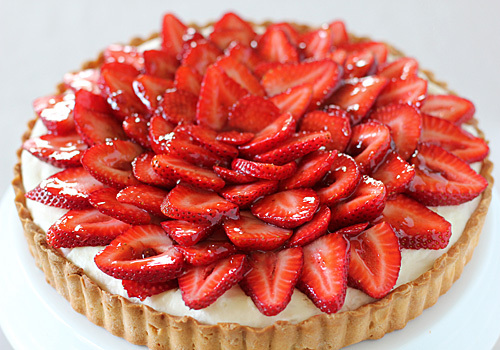 The strawberries are what really make this dessert, so buy, or if it is strawberry season, pick the sweetest strawberries you can find. The first time I made this recipe, I prepared it exactly as the recipe stated. This time around I used my favorite tart crust and I added a bit of gelatin to help stabilize the mousse filling. These changes made for one spectacular dessert that I will not be waiting years to make again. It is a beautiful Easter Sunday here. If you are going to have people hanging around the kitchen smelling the ham and talking your ear off as you halfway listen while trying to prepare the rest of the food on this or any other day, this is a great way to stave them off. 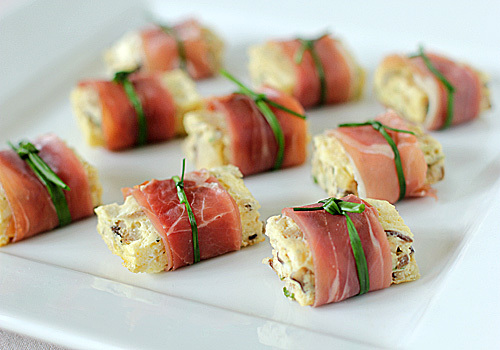 These pop-able savory treats have just the right taste to hold off the horde at any gathering where the smell of the main course is causing tummy rumbling to register audible decibel levels. If you are still undecided about what dessert you will be making this weekend, here is another idea to throw into the mix. We had dinner with family this past weekend and I offered to bring dessert. A nice byproduct of bringing dessert was the opportunity to make this cake. This is one of those recipes that I tore out years ago (Martha Stewart Living, April 2003, page 207 to be exact) and filed away in my stack of to-dos. 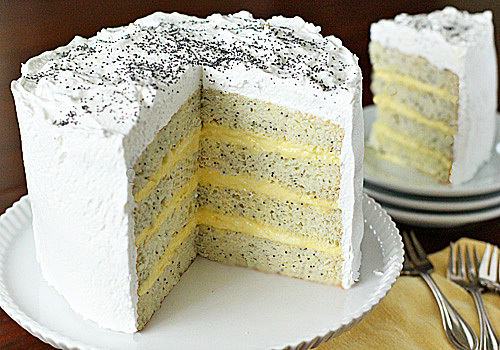 It is a simple white cake studded with poppy seeds, layered with lemon curd that is lightened with whipped cream, then blanketed in a white, marshmallowy seven-minute frosting. It is light, lemony, sweet, and just perfect for this time of year. The only change I made was to use a packet of whipping cream stabilizer for the heavy cream to keep it from weeping once folded with the lemon curd. Overall this is a great recipe, but preparing the cake does require a bit of time in order for the filling to set properly. However, the filling and the cake can be made the day before, then assembled the morning of and frosted. Just remember-- due to the lemon curd filling, the cake needs to be chilled. I don't know why it's called "Lady Cake". I do know that this layered beauty gets a thumbs up from men and women alike. 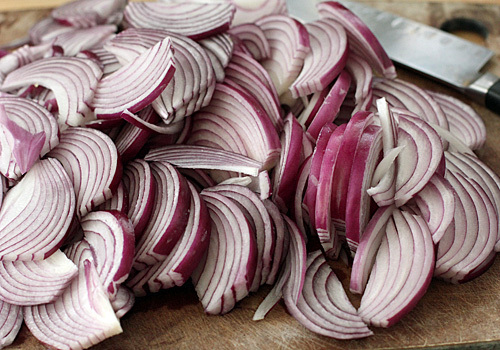 Here is another staple/building block in my cooking. 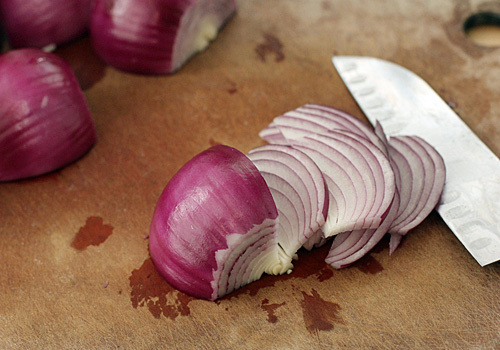 I use roasted beets in salads, vinaigrettes, and even sandwiches, but most of the time they are served warm from the oven with a bit of butter and vinegar as a side dish to our meal. Roasting beets brings out their natural, earthy sweetness that my family just can't get enough of. Summer, spring, winter, or fall, we enjoy these tasty gems all year long and they will be on our upcoming Easter menu in some way, shape, or form. The recipe I am giving you is more of a guideline than a recipe. I have offered several ingredients to suit your own taste. 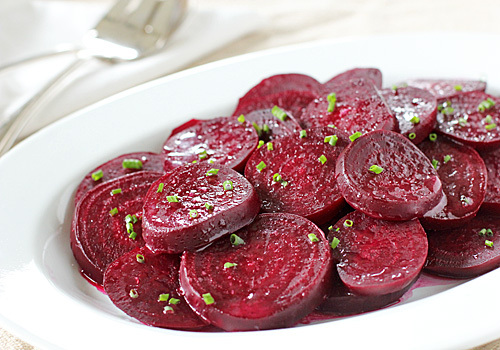 My favorite way is to simply toss the sliced or quartered beets with a bit of butter, red wine vinegar, salt and chives. I have family that enjoys them with orange juice and dill (that's the Scandinavian side). There are also those of us that enjoy them straight from the oven with a sprinkling of salt. Just remember, make them for you, make them your own. 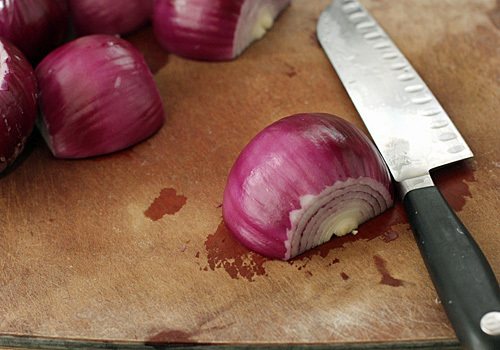 Before I give you the recipe, I must leave you with a warning-- beets STAIN everything and I mean everything. With that in mind, I would like to give you two tidbits of valuable beet preparation and consumption information. First, buy a box of disposable gloves from the drug store to wear when you peel them. That will prevent your hands from looking like you walked away from a crime scene. Second, put a little note on the bathroom door to remind yourself that you ate beets the night before. That will stop you from making a frantic phone call to you doctor☺. When planning a menu, I usually don't have a problem coming up with the appetizer, main dishes, sides, or salads. My dilemma is the dessert. Not that I can't think of one, but there are just so many that I want to try. This dessert has been on my radar for quite some time now and it finally worked its way into my kitchen. My only regret was waiting this long. Like the Raspberry Crumb Bars, this is a dessert with simple ingredients that produces spectacular results. One would think that with the almond paste there would be an essence of maraschino cherry or heavy almond extract (both of which I do not care for), but the results yield the contrary. 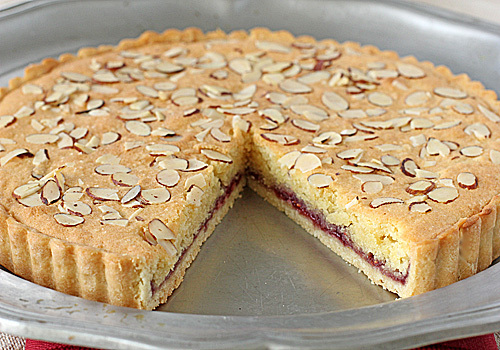 The almond paste lends a sweet, nutty taste that matches perfectly with the raspberry preserves. I added of a bit of lemon zest in the filling which makes the tart just sing. The crisp crust, the jammy preserves, and the cake-like filling all add up to one incredibly delicious package. You can certainly serve the tart as is, but whipping up a batch of lightly sweetened chantilly cream really adds another texture and flavor. I have to be honest, this tart was so good that I even said out loud that if I couldn't have chocolate anymore (scary thought), then I would be o.k. as long as I had this tart. It would be perfect to serve at any time of year, but I think it would be well received if this tart was on your menu this coming weekend for those spring celebrations. We enjoyed these so much a couple of Sundays ago that I wanted to put them on the menu again this week. I have enjoyed mushrooms stuffed with sausage and cream cheese which are good, but I was looking for something with layers of flavors that had an Italian twist. Mushrooms stuffed with chopped fennel, sun-dried tomatoes, garlic, some Italian cheeses, fresh basil, and a few changes to add even more flavor and texture-- delizioso! 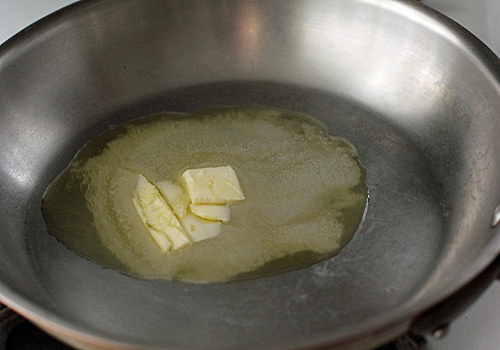 I added some white wine to deglaze the pan, making sure to keep all of those sautéed flavors. I also added a bit of balsamic vinegar and crushed red pepper flakes to add a little kick and to bring all of those Italian flavors together. Once stuffed, I topped the mushrooms with a mixture of parmesan cheese and panko crumbs for an added texture element. 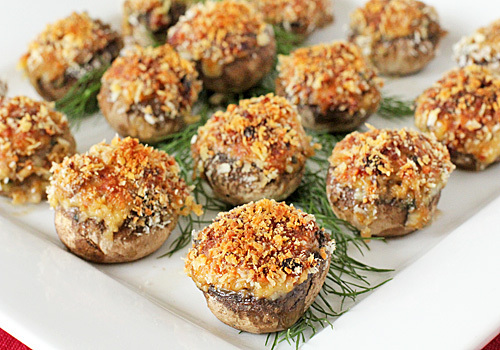 The meatiness of the mushroom filled with a creamy and savory filling and topped with a cheesy crunchy top--wow, do these little babies deliver the flavor! Still enjoying my overstock of preserves, I needed to satisfy my sweet tooth. 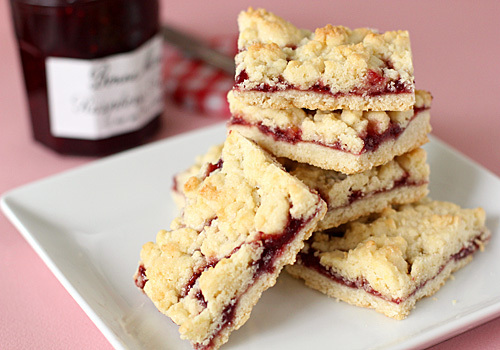 What better way to do so than with these Raspberry Crumb Bars? A buttery crust accentuated with a touch of almond extract, a layer of good raspberry preserves, and another buttery crumb topping kissed with lemon-- yum! Although my family would devour these at anytime of day or year, I would suggest serving these at a brunch, luncheon, afternoon tea, or even on a dessert tray for the upcoming spring celebrations. They have that not overly sweet, yet fruity finishing touch to end a meal or share at a gathering. I love it when the sales at the market help me with my meal planning. This past week, my local market had my favorite preserves on sale. I stocked up on several fruit flavors and raspberry jam made the cut. I knew right away what I was going to make first-- this raspberry vinaigrette. I use this vinaigrette with many dishes and salads. 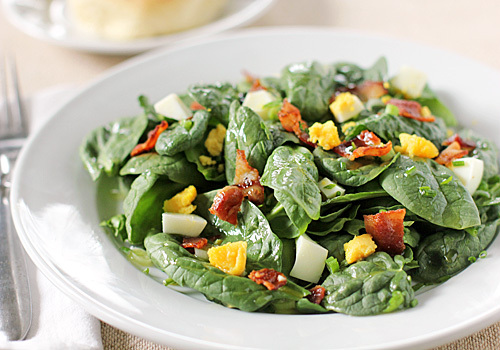 It is perfect when tossed with berries, mixed greens, slices of creamy goat cheese, and candied nuts of my choice. Even grilled chicken breasts take on a whole new flavor when brushed with this vinaigrette. 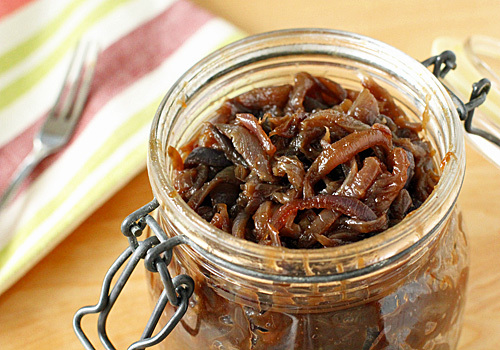 It is sweet and slightly nutty due to the addition of various nut oils in lieu of the standard extra-virgin olive oil. If you have nut allergy concerns, then I would suggest using a flavorless oil, like canola or safflower. 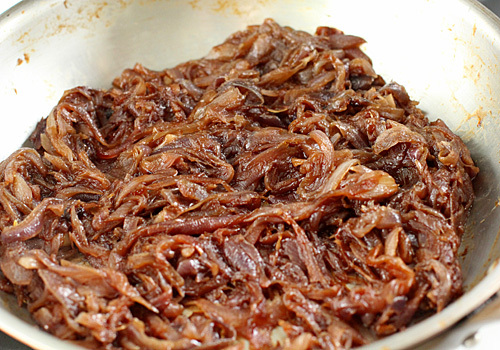 The recipe calls for minced shallots, but if I am making this in advance or if I know there will be leftovers, I omit the shallots and add them just before serving. 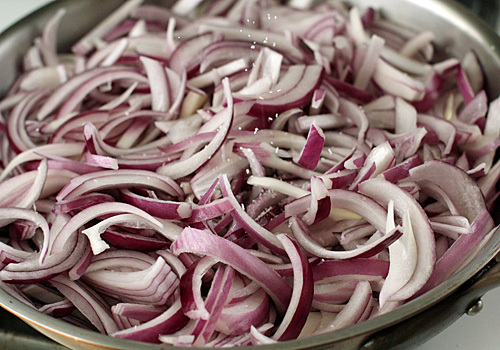 Otherwise the onion flavor will become overpowering. 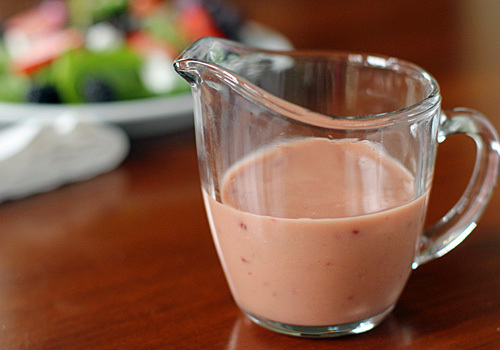 You can make this vinaigrette by hand, in the blender, with an emulsion stick blender, or you can even have your kids shake it up in a jar. Any way you make it, it will be good. It's feeling like summertime in April today, so I feel like digging a spoon into a dessert that evokes thoughts of outdoor seating at a bistro in May. These Chocolate-Layered Espresso Jellies provide the flavor and the fun-to-eat format that everyone can enjoy. 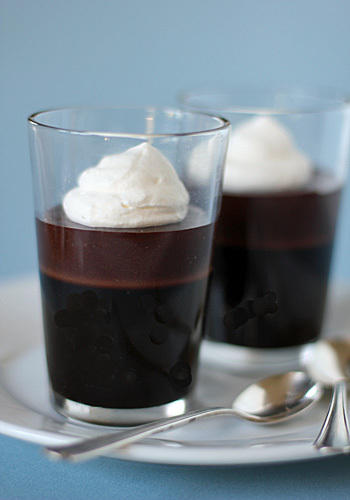 The jelly layer is essentially grown-up jello and the chocolate layer is creamy and decadent. The combination of these layers in one spoonful are a textural marvel that explodes with flavor in every bite. The recipe says to serve these after the chocolate layer has set just 20 minutes in the refrigerator. That will ensure that the chocolate is cool, but still creamy. 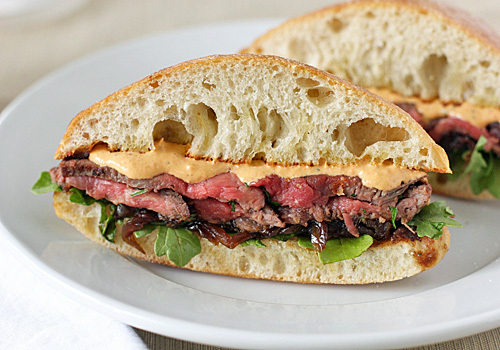 However, you can make these earlier in the day. Just prepare the jelly layer and chocolate layer according to the recipe. Remove them from the refrigerator 30 minutes before serving to allow the chocolate layer to soften. 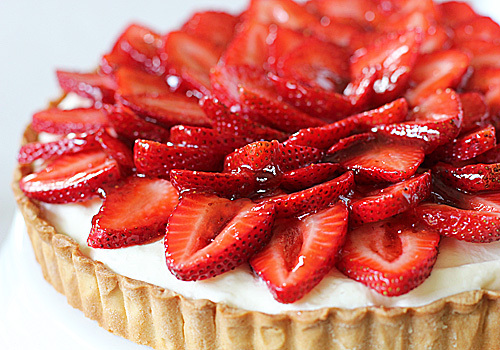 Top with the lightly sweetened whipped cream and serve. School is back in session this week, so it is time to get into the school lunch/after-school snack groove. What better way to do that than with a little treat? I found this recipe in Desserts 4 Today by Abigail Johnson Dodge. It is a cookbook filled with simple and delicious dessert recipes, all of which contain just four ingredients. If baking and desserts are not your forté, I strongly urge you to check out this book. Her technique is simple and straightforward, giving your "sweet" skills in the kitchen the best chance for success. Johnson offers variations of each recipe listed in the book. 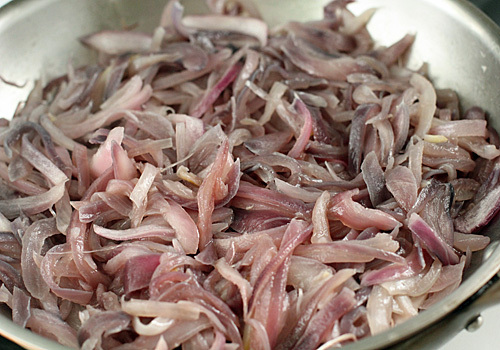 This gives the cook the opportunity to make them adaptable to his or her own taste. As you know, I am a strong believer in making it for you and making it your own. I followed my own advice with this recipe by adding a few tweaks. These mini morsels are the perfect bite-sized snack. They are fudgy without being overly sweet, and the Nutella completely satisfies that chocolate craving. Normally, I don't care for nuts in baked goods like bars or brownies, but being as they are just sprinkled on top in this recipe, I'm good with it. They add welcome flavor and texture in this case. Now here comes the part where I make it my own. Like most of my chocolate treats, I like to add a bit of espresso powder to bump up that chocolate flavor. I also add a splash of Frangelico (a hazelnut liqueur) to bring out that hazelnut flavor. Both additions are optional, but really good. 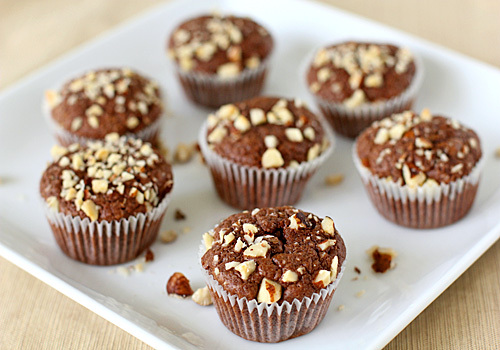 What I like best about this recipe is that they are made in a mini muffin pan, therefore I don't have to feel guilty about having that second one! Sometimes the anticipation of an experience can overshadow or even diminish its actual occurrence. The lead up to eating this Sunday Sugo puts the experience of eating it in this form of peril. The smell of this sauce on the stove all day reaches every corner of the house, causing many a premature stomach grumble. After eating this sauce plenty of Sundays past, I can assure you that the taste delivers on all of that anticipation. The pork and sausage bathe all day in the red sauce, each lending the whole pot the full depth of their flavors. 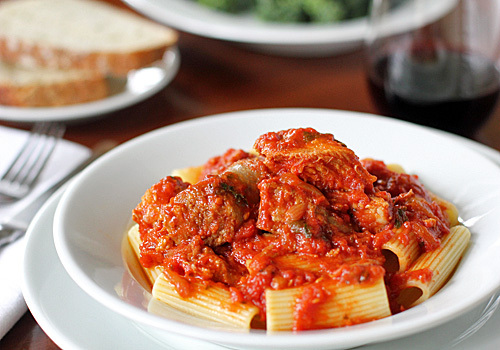 The sauce clings nicely to the rigatoni, a bite of which can offer a delicious pause while you ponder the "pork or sausage bite conundrum". Shake on some crushed red pepper flakes, grab a piece of warm, crusty bread and have at it. This is the perfect meal to serve to a large gathering of family and friends with bottles of red wine flowing, though it is equally enjoyed by a small group with leftovers to be had for another weeknight meal.